Natural Therapy: A Manual of Physiotherapeutics and Climatology discusses natural ways of healing and treating certain diseases and disorders. The authors discuss the use of water in bath-treatments as used by John Smedley, Winternitz, or through methods known as "Kaltwasser Kuranstalten," or "Kneipp cure." 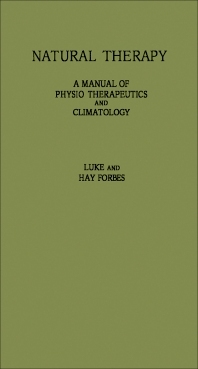 The book explains the general principles of hydrotherapy or the systematic application of water at different temperatures in varying ways to the body surface. Water can have a therapeutic effect due to its temperature, volume, mechanical means, and chemical forms. The authors also discuss taking baths including general precautions (after physical exertion), techniques (arm, foot bath), use of drip sheet, and douches. Water in Nauheim baths are either naturally or artificial charged, in varying degrees, with carbonic acid gas, and mixed with small amounts of chloride and sulphate of soda. The bath is good for the circulatory system. The authors discuss other natural methods of treatment such as steam bath, massages, hydro-electric baths, and special diet cures. This book can be helpful for care givers, health workers, physical therapists, practioners of alternative or holistic medicine, and general readers who have an interest in natural treatment and healing. IV. The Technique of Compresses, Packs, Poultices, Etc.